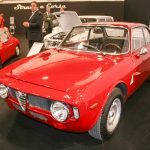 We are fortunate indeed to have John Elwin, a recognised Alfa Romeo expert, to guide us through the fantastic selection from the Italian craftsmen that was on display at this year’s Techno Classica. Avanti! 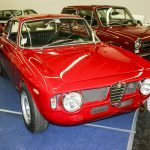 Alfa Romeo enthusiasts visiting the 29th Techno Classica Essen would surely not have been disappointed for amongst the 2,500 classics packed into the Messe Essen was a good array of the Milanese masterpieces from across the ages. What’s more one unique example picked up the ‘Best in Show’ accolade from the concours judges, whilst two others were amongst the trophy winners. 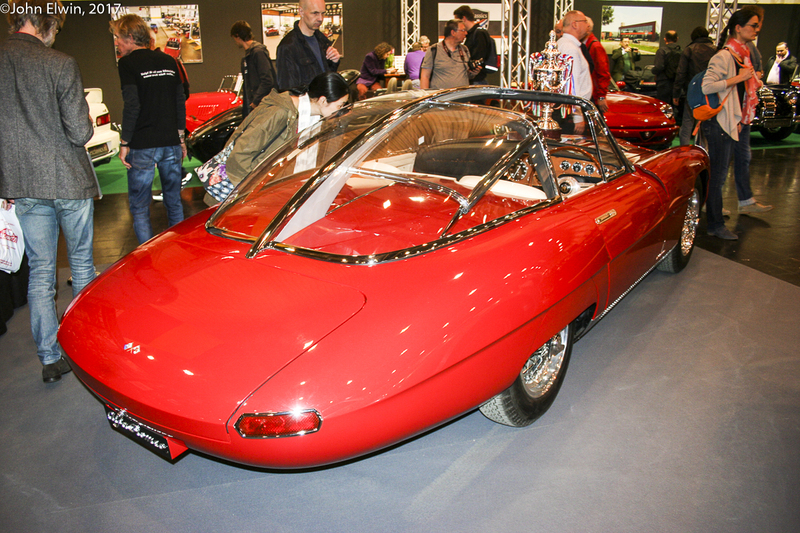 The FIVA-endorsed ‘Best in Show’ award was presented to the 1960 Alfa Romeo 6C 3000CM Pininfarina Superflow IV exhibited by Britain’s Jim Stokes Workshops and Fast Cars Ltd., from the USA. The car (chassis #00128) has an interesting history, as it was one of six Colli-designed Coupe’s hastily built by the works for the 1953 competition season. The original plan had been to use the futuristic-looking Disco Volante but that proved to be aerodynamically somewhat unstable in testing. 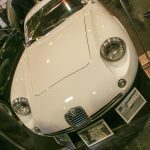 This car’s primary claim to fame was to be taken to second place in that year’s Mille Miglia by Juan Manuel Fangio, only losing out in the closing stages to Marzotto’s Ferrari when suspension damage sustained by the Alfa left it with steering on only one side. Nevertheless the Argentinian maestro was still averaging more than 100mph! It was a particularly competitive year, with the Mille Miglia counting towards the World Sportscar Championship, so the contest at the front was ferocious, not only between the leading Italian marques of Alfa Romeo, Ferrari and Lancia, but also with the likes of Aston Martin and Jaguar sending works teams. 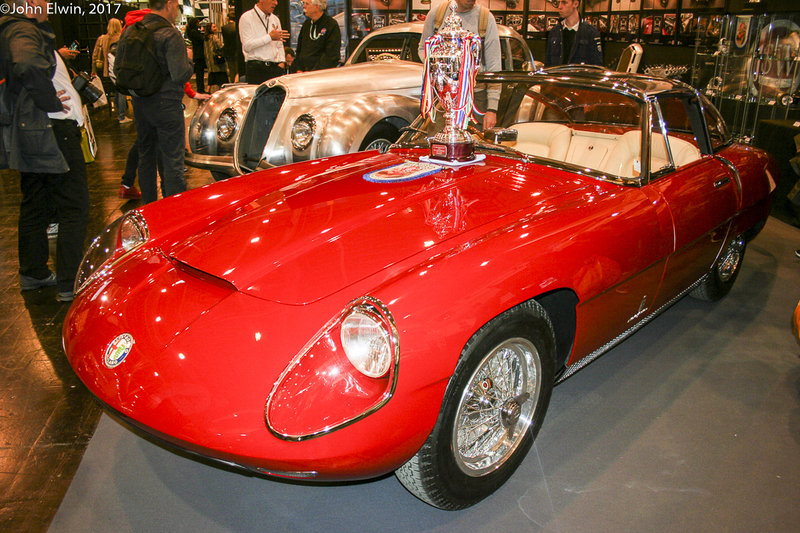 At the end of its competition life chassis #00128 was packed off to Pininfarina, where it was used as the base for a string of show cars – there was no revered retirement even if it was an ex-Fangio car! 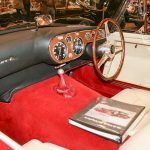 It first appeared at Geneva Motor Show in 1956, Paris later the same year and Geneva again in 1959, eventually appearing in the form you see today at Geneva in 1960, when it incorporated various features from the previous designs such as the plexiglass roof. 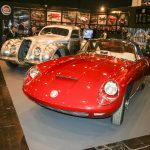 Styling cues for the forthcoming Duetto Spyder are also evident, and with its show career over the car was packed off to the US where it toured dealerships attracting buyers into the showroom where they would hopefully buy a new Duetto. The Superflow IV is now in the hands Craig Calder’s US business Fast Cars Ltd., and rumour suggests it could be yours for around $10 million. Whilst the bodywork has gone through various transformations, it is still very much a race car mechanically, with its 3.6-litre engine, so not really suitable for road use. 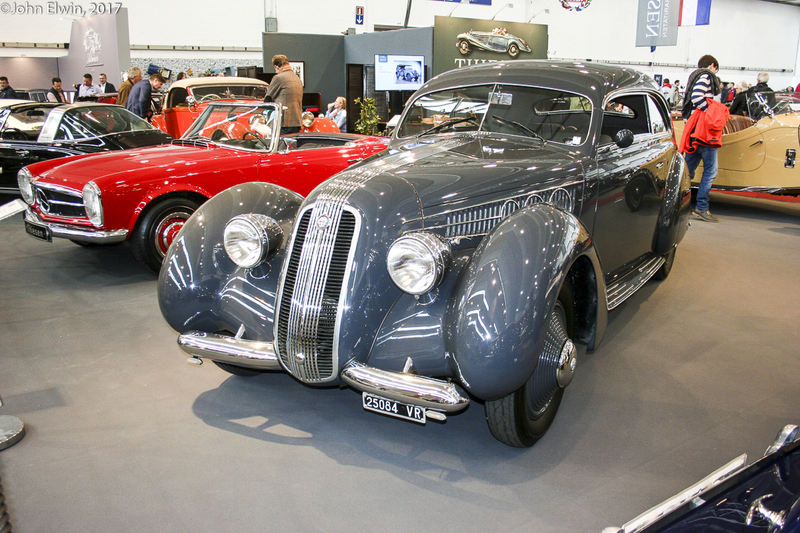 Another worthy winner was the stunning battleship grey 1937 Alfa Romeo 6C 2300B Pescara Coupe Pininfarina exhibited by German specialists Thiesen. 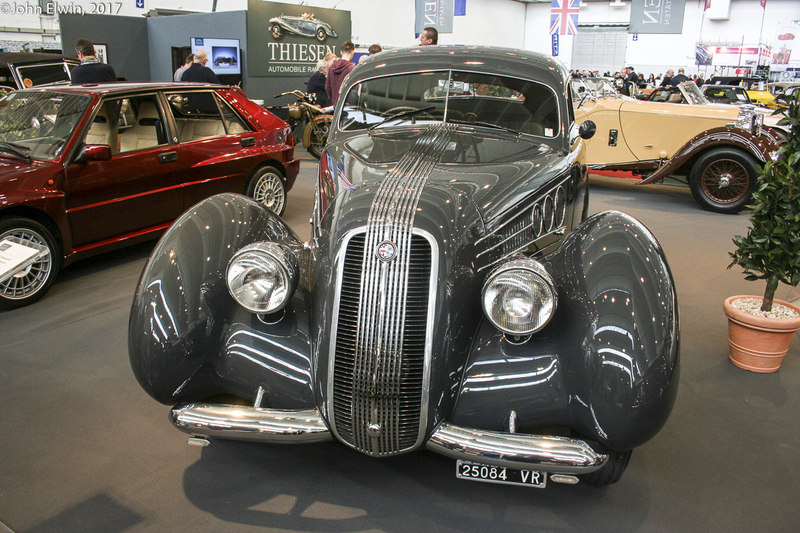 One of only two cars built, its sister car was first shown at the Concorso d’Eleganza Torino in 1937, where it won first prize, naturally! In more recent times this car has done the rounds of prestigious events, picking up awards in places like Villa d’Este, Pebble Beach and Kuwait. 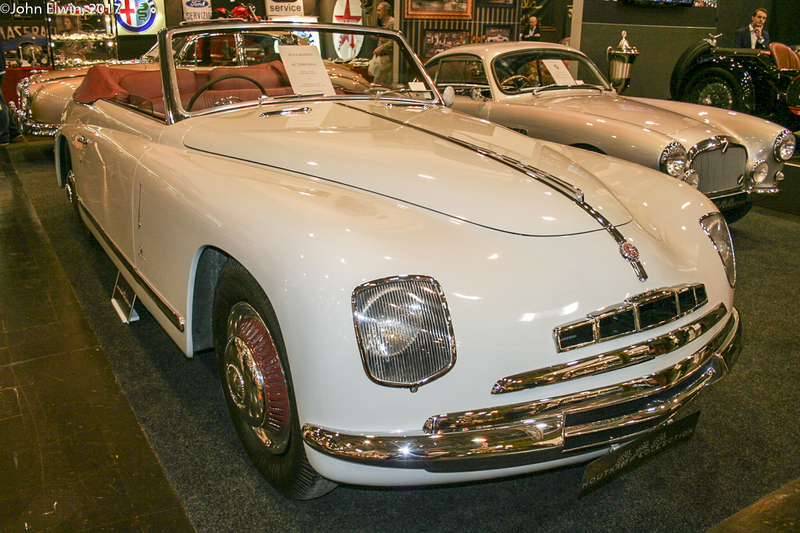 It was not the only Alfa Thiesen’s brought along to Essen, for also on offer was a 1949 6C 2500 SS Villa D’Este Cabriolet, this time with body by Touring. 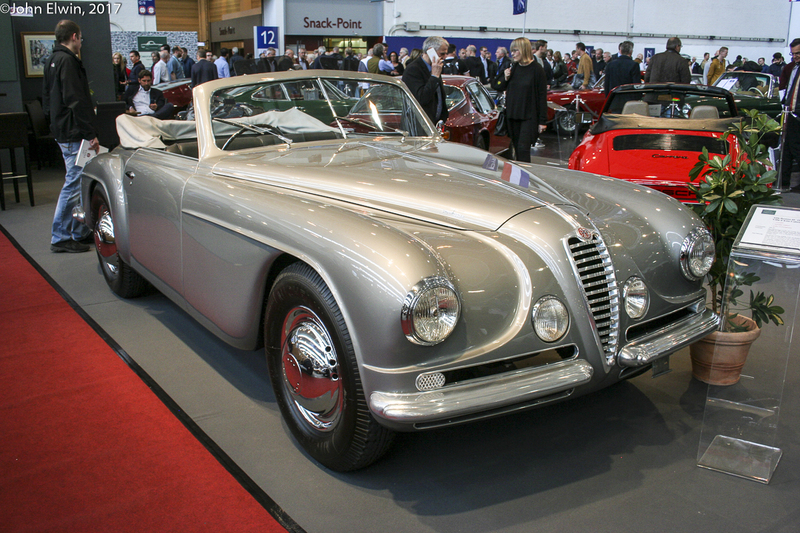 The rather elegant metallic grey machine was first seen at Turin’s Autosalon in 1950. 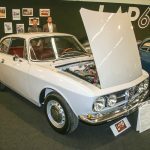 The third of our prizewinners was a 1962 Giulietta SZ Coda Tronca, one of just 30 examples built and delivered to the Swiss Alfa Romeo importer. 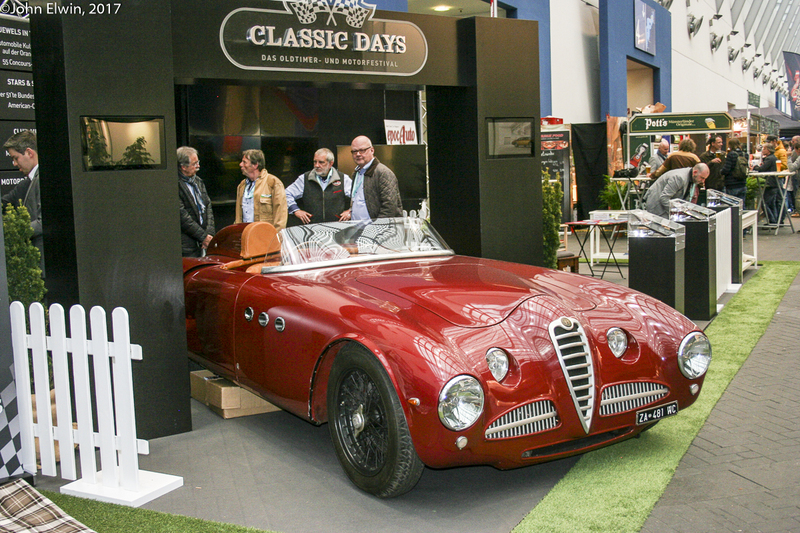 The first owner, one Pierre Scaramiglia, used the car to contest various national and international events before selling it on to a new owner in Geneva, who used it on the road until the engine blew up. 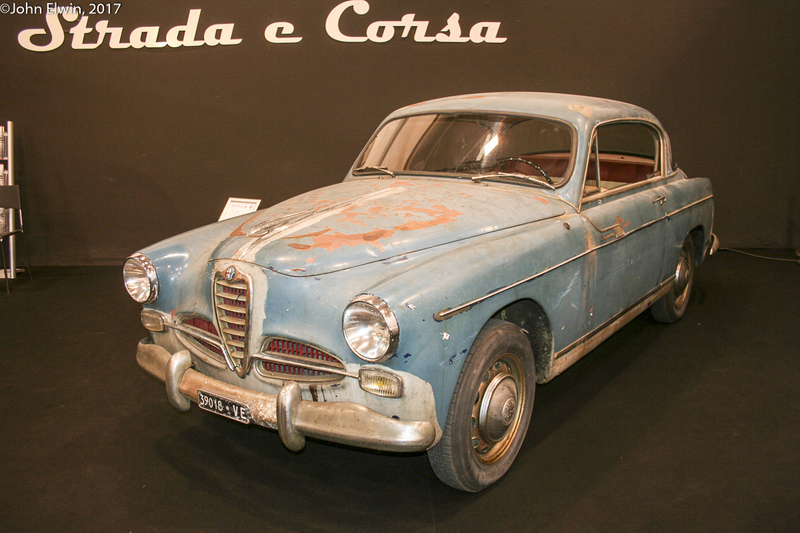 He replaced the blown unit with a Giulietta 1300 engine before selling the car on. It eventually ended up with the current owner who has spent a considerable sum restoring it mechanically to original specification, complete with correct 120 series engine. As a result it was awarded a ‘Targa d’Argento’ award at Villa d’Este in 2006. Dutch dealers VeniVidiVici have it on offer for a mere 675,000 euros. 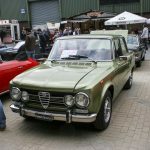 By comparison, the 1968 1300 GTA Junior on sale at Gallery Aaldering sounds cheap at 245,000 euros. It is an ex Rhoddy Harvey Bailey car, but not the works racer he drove for Autodelta. However it is a matching-numbers car built in 1968, rather than being works car raced by Harvey Bailey at the time it seems he acquired it at a later date to race in the UK. Nevertheless it is a desirable and original example of the model, of which there are many replicas. 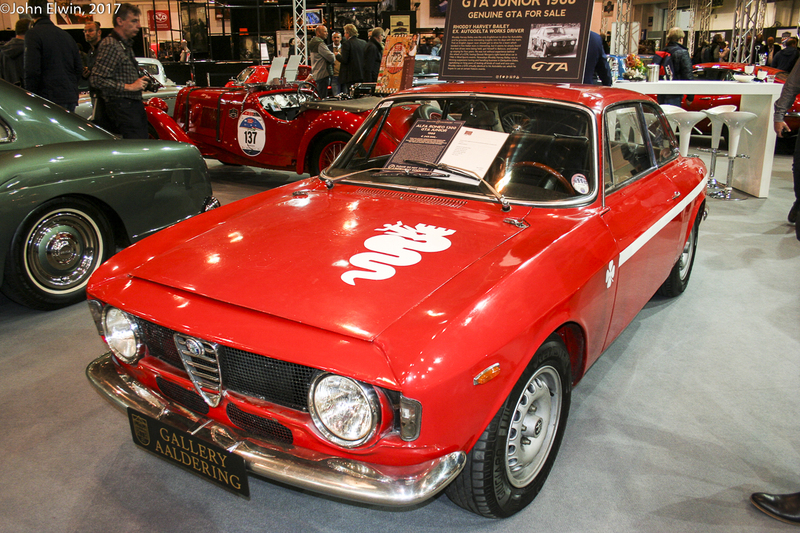 Indeed the 105-Series Giulia range is popular in all its forms (saloon, coupe, spider) and many examples were to be found dotted around various dealer stands throughout the show. 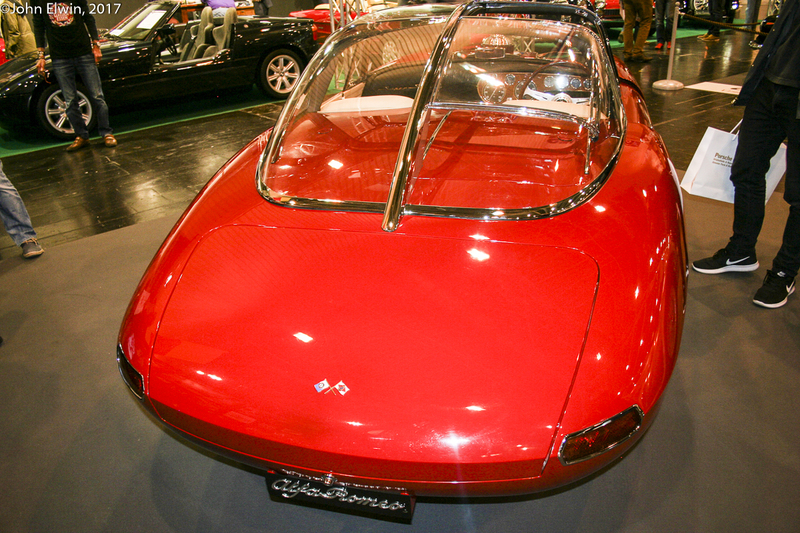 Also related was the Montreal, the V8-engined confection created for the Expo ’66 staged in Montreal, Canada. 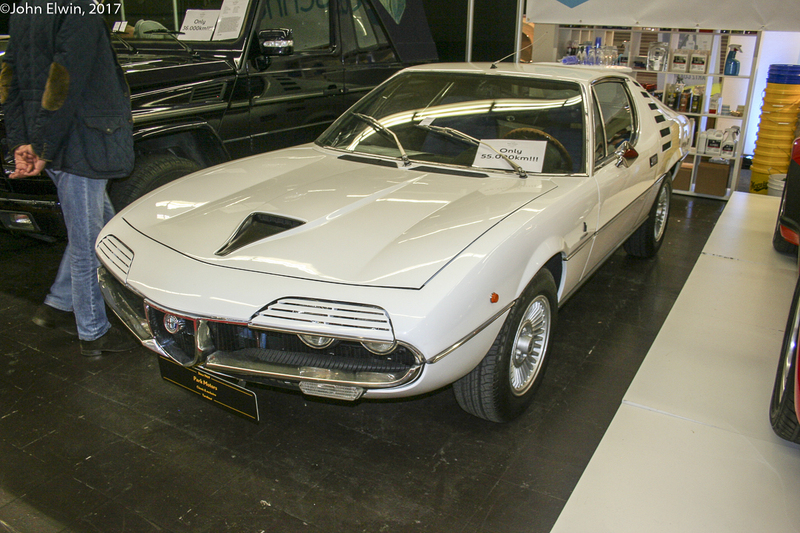 A very nice low mileage example in white was on offer in Essen. 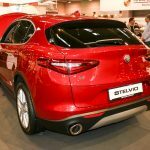 Alfa Romeo has consistently put more effort than most manufacturers into maintaining its heritage, but whilst the company stand in Essen was providing a first opportunity for many to see the new Stelvio SUV, they also brought along some exhibits from the newly revamped Museo Storico. On show was an RL Super Sport, of which just 393 examples were built during the period 1921-27. 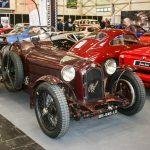 It had a sporting pedigree, a Corsa version having taken part in the 1923 Targa Florio, whilst five RL SS’s competed in the 1925 Mille Miglia, the Gastone Brilli-Perj car even leading the race. There was more sporting influence in the 1931 8C 2300 Spider Corto Mille Miglia, the chassis being developed from the 6C 1750 model. 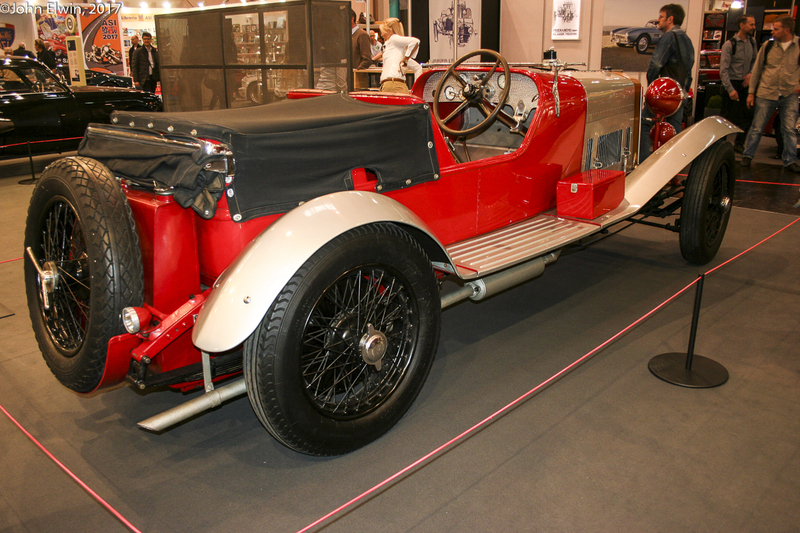 The model debuted on the Mille Miglia in 1931, Campari only narrowly being defeated by Carracciola’s Mercedes-Benz. 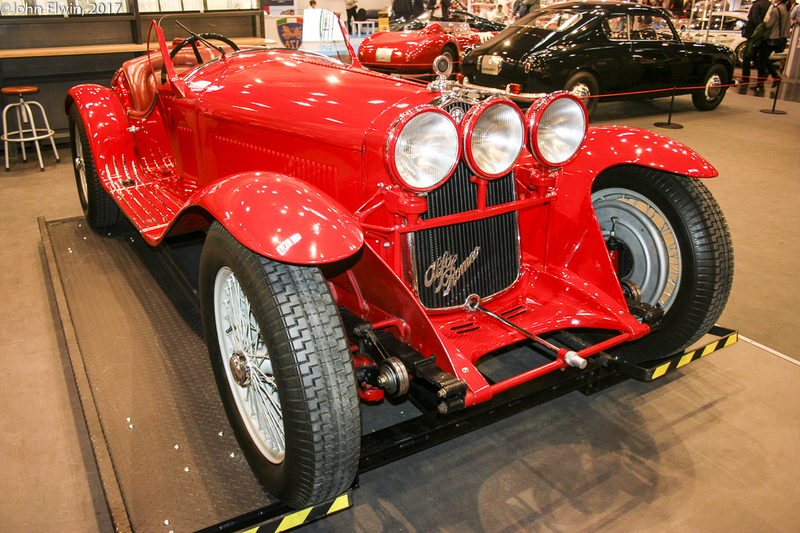 However, Alfa filled nine of the top ten places in 1932, with Borzacchini winning from Trossi. The following things went even better with a clean sweep of the top ten places, Nuvolari being victorious. 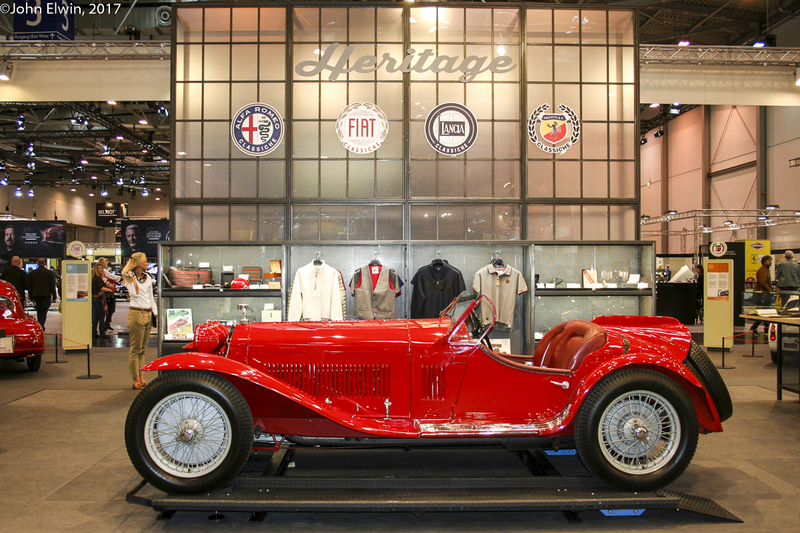 Success for the model was not limited to the Mille Miglia either, for despite building just 308 examples of the 8C 2300 between 1931-34, there was also success in the Targa Florio, at the Le Mans 24-Hours, and even in Grand Prix racing. Speaking of Grand Prix cars, a P2 did appear elsewhere, but with no information. 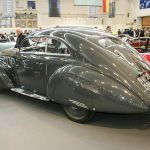 Making a return visit, having first been seen at Essen two years ago, was the 1947 Ghia-bodied 6C 2500, this being one of two surviving examples of the four originally built. 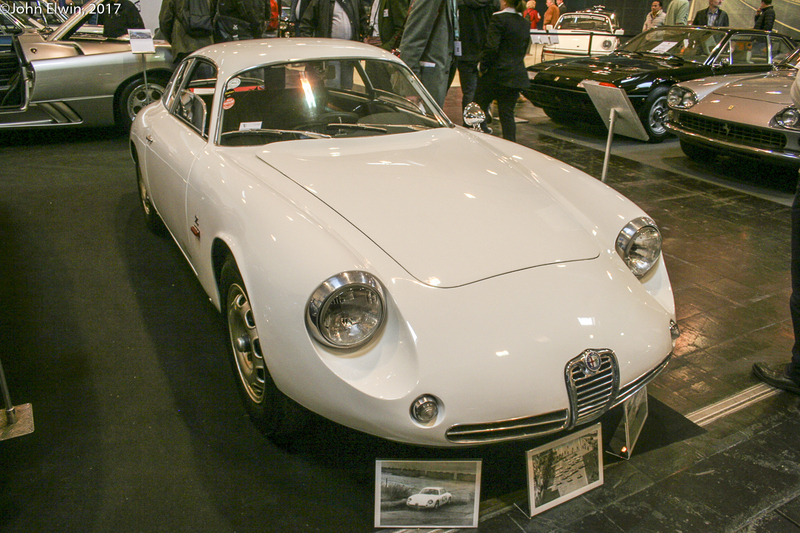 Probably not the most beautiful body ever to adorn an Alfa, it nevertheless has been a class winner at Villa d’Este. 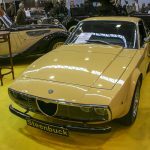 It was sold by The Houtkamp Collection from Holland after showing it at Techno Classica in 2014. Now that owner has spotted something else Houtkamp have on offer, so has put it back on the market. Yet another Dutch dealer, Strada e Corsa, was offering – actually it sold early on – a 1956 1900 ‘Primavera’ Coupe with bodywork by Boano, looking remarkably like a Sunbeam Rapier from some angles. It was severely in need of a full restoration although appearing complete. 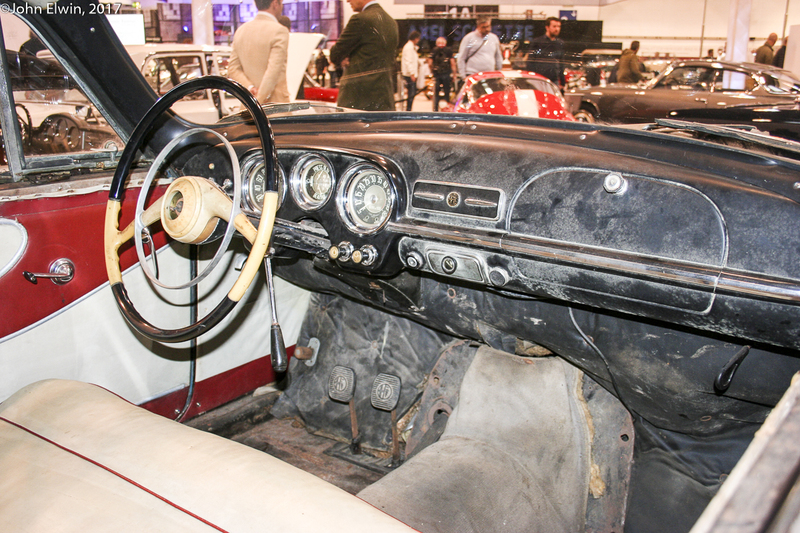 However, it was a matching-number car complete with comprehensive documentation and a known history so well worth the effort, especially as it is one of the few remaining survivors of just 300 cars built. 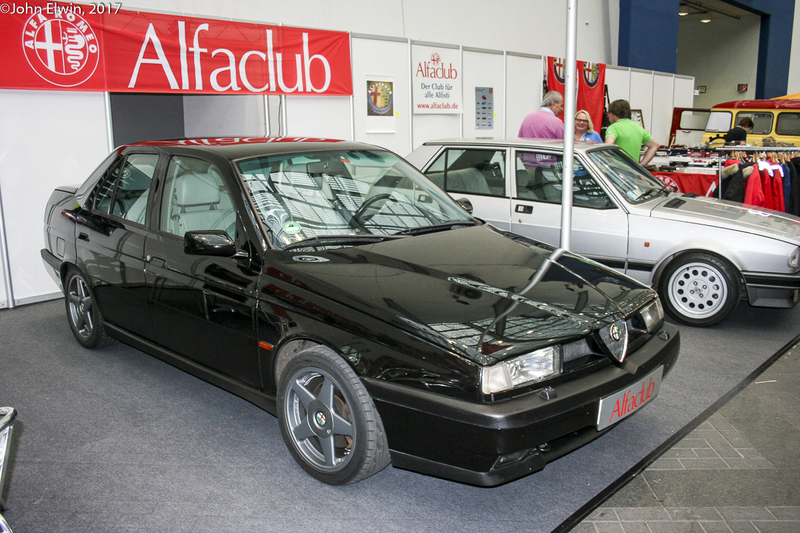 Certainly not in need of restoration was the gleaming black 155 V6, a local car that appeared on the German Alfaclub stand, where they were marking the model’s 25th anniversary. The understated, and under-appreciated, 155 provided the basis for a tremendous racing success both in highly developed DTM form and in Super Touring championships around the world, Gabriele Tarquini most notably sweeping all before him in the British Touring Car Championship in 1994 when as many as ten manufacturers competed with works- or works-supported teams. The 155 was replaced by the more stylish 156, it too achieving great success in touring car racing. 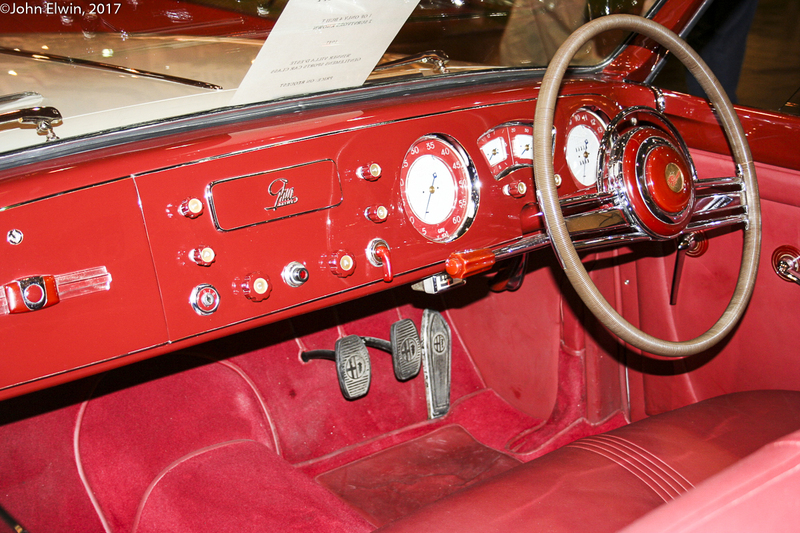 It is a bit too new yet to be appearing in classic car shows. However, one trader was offering a real rarity, in the form of a car devised for a still-born Spanish racing series. With more than a passing nod to Bernie Ecclestone’s 164 Procar prototype, the 2001 Alfa Romeo 156 ‘Maxi-Turismo’ featured carbon fibre 156 bodywork a-top a Tampoli sports prototype chassis. The Enzo Coloni-built car is powered by a race spec. version of Alfa’s 3-litre V6, mated to a Hewland sequential ‘box. There we have it. The scale of Essen being what it is I am bound to have missed something but hopefully I’ve spotted all the important ones! 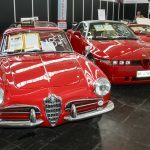 This entry was posted in Vue de l'autre côté de la Manche and tagged 1931 Alfa Romeo 8C 2300 Spider Corto Mille Miglia, 1937 Alfa Romeo 6C 2300B Pescara Coupe, 1949 Alfa Romeo 6C 2500 SS Villa D’Este Cabriolet, 1956 Alfa Romeo 1900 ‘Primavera’ Coupe, 1960 Alfa Romeo 6C 3000CM, 1962 Alfa Romeo Giulietta SZ Coda Tronca, 1968 Alfa Romeo 1300 GTA Junior, 2001 Alfa Romeo 156 ‘Maxi-Turismo’, Alfa Romeo, Alfa Romeo 155 V6, Alfa Romeo Montreal, Alfa Romeo RL, Essen, John Elwin, Techno Classica on July 4, 2017 by John Brooks.